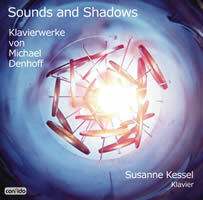 Michael DENHOFF: Sounds and Shadows — Klavierwerke von Michael Denhoff. Susanne Kessel (piano), Selçuk Sahinoglu (clar.). confido 270405. No American distributor, but available directly from confido/Capitol Sound Studios (info@capitolsound.de). German pianist Susanne Kessel is one of European new music’s greatest friends and this new release is another demonstration of her ability to perform with charm, grace and virtuosity. Michael Denhoff (b. 1955), a resident of Bonn, occupies a unique position in German music. His influences come not so much from Lachenmann or Stockhausen as from Feldman, Kurtág and Nono, with touches of the post-expressionism of his German predecessors Boris Blacher or Bernd Alois Zimmermann. The core duality of his music lies almost always between light and shadow, introvert and extrovert, rendering each piece familiar yet unpredictable. The opening work, … al niente …, Op. 95 (2002), builds from a Feldmanesque motif which appears and disappears regularly, in whole or in part, later in alternation with a more restive theme. In its 23 minutes, it presents a vast spectrum of piano polarities, from the instrument’s high haze to its lowest growl, each shift in temperament separated by shoals of silence. Next is the nine-movement set of miniatures called Nachtschattengewächse, Op. 96 (2001/04). Each subtitled movement centers on themes of night, growth, mystery and light. This does not imply that the piece offers a unified front. Indeed, its nine movements, ranging from 0:24 to 2:44, hold more surprises than reprises. The last work is the most introspective and the CD’s namesake, Sounds and Shadows, Op. 86b (1999). Its 33 minutes are mostly subdued, its inward glances seeming more personal and elusive than those of the opening piece. In the work’s second half, almost imperceptibly, a distant, on-and-off-again clarinet reflects on Kessel’s monologue. The closing passages are relegated solely to the clarinet, an autumnal foghorn from afar. The music’s duration bespeaks an intense level of engagement, the now plaintive, now anxious textures aptly summing Denhoff’s aesthetic. Thanks in good part to an excellent recording, Kessel sparkles throughout these rich soundscapes. 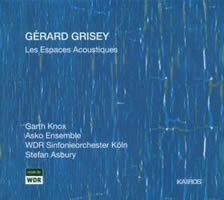 Gérard GRISEY: Les Espaces Acoustiques. Andrew Joy, Joachim Pöltl, Kathleen Putnam, Hubert Stähle (horns), Garth Knox (viola), Stephan Blaumer (viola), Stefan Asbury (cond. ), Asko Ensemble, WDR Sinfonieorchester Köln. Kairos 0012422KAI (http://www.kairos-music.com/). Distributed in the US by ArkivMusic (http://www.arkivmusic.com/). Les Espaces Acoustiques accrues in instrumentation from a solo viola to a septet to 18 players to 33 players to 83 players to four solo horns and 82 players. Listening to these competing cycles back-to-back is a rather startling experience. Tempi fluctuate wildly. Here, the Dutch and German performers require 97 minutes for the six-piece set, whereas the French take 87. Court-circuit, devoted to the spectral school, delivers the more authoritative account, largely because the music benefits from a quicker, but by no means harried, pace. I prefer by a slight margin Garth Knox’s account of the Prologue to the one on Accord, not because it is speedier, but because he brings a greater tension to the music’s lyricism alternating with brusque force. The Asko performance also proves enlightening, as in the more sensual effects of the middle sections, Périodes (7 players), Partiels (18 players) and Modulations (33 players), the interpretation more obviously lingering on the score’s pure auditory beauty. This slow-footed Périodes, alas, falls short of the piercing quality of its companion section. The climactic passages require a motoric drive lacking here. Despite excellent musicianship, Asko’s Partiels seems equally stupefied and directionless. Both readings of the rhythmically complex Transitoires show this to be an orchestral masterpiece of shifting contours. Both surpass Pierre Boulez’s original recording of Modulations (Erato 4509-98496-2, O/P), a work which he seems not to have understood. Asbury again delineates the textures somewhat in Modulations and Transitoires, but to no great detriment. The playing in both cases warrants praise. The sets complement each other in gratifying ways. Because of the sheer cohesion his musicians bring to the scores, Valade leaves a greater impression and will probably be the standard against which future recordings are judged. However, in offering committed performances and a radical interpretation, Asbury succeeds on his own terms. 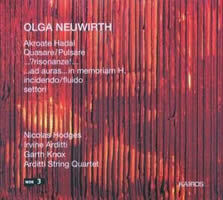 Olga NEUWIRTH: Chamber music. Akroata Hadal (string quartet, 1995); Quasare/Pulsare (violin / piano, 1995-96); …?risonanze!… (viola d’amore, 1996-97); …ad auras…in memoriam H. (2 violins / getabera [wooden drum], 1999); incidendo/fluido (piano and CD-player, 2000); settori (string quartet, 1999). Irvine Arditti, Graeme Jennings (violins), Garth Knox (viola d’amore), Nicolas Hodges (piano), Rohan de Saram (cello, getabera), Arditti String Quartet. Kairos 0012462KAI (http://www.kairos-music.com/). Distributed in the US by ArkivMusic (http://www.arkivmusic.com/). Austrian composer Olga Neuwirth (b. 1968) has gained a reputation of late, no doubt boosted by her previous Kairos CDs and successful opera Lost Highway, based on the David Lynch film with a libretto by Nobel laureate Elfriede Jelinek. Her music, while partaking of a (Johann) Straussian lilt, owes more to Lachenmann & Co. than to Austria’s belle-époque past. Often impressive and undeniably well-written, her work lacks individuality. Admittedly, originality in art need not equal genius, but how, I wonder, does one distinguish her music from the quotidian work of others of her generation? The string-quartet pieces which open and close this recording are stereotypically modernistic and tension-besotted, never quite extending beyond the parameters Ferneyhough and Lachenmann established decades ago. The high squeaks say it all. Similarly, Quasare/Pulsare fails to leave an impression, despite some well-placed violin knocks, piano preparations, use of the e-bow on the piano, and other by-now-familiar extended techniques. In avoiding the obvious romantic connotations of the viola d’amore by exploiting mistunings and atypical resonances in her …?risonanze!…, the composer scores a coup. I especially enjoyed the graceful writing for the instrument’s bridge, nicely setting apart the more predictable filigree work. The violins-and-drum trio …ad auras…in memoriam H. is hit-and-miss: Its tunings are again of interest and the occasional drum accompaniment hearkens back to one of George Antheil’s early violin / piano sonatas, but there is too much wandering to sustain one’s interest. Most noticeable is incidendo/fluido: As the live piano material centers on the instrument’s middle register, the listener also hears the distinctive sound of the Ondes Martenot, emanating from a CD player stored deep within the piano itself and clearly echoing an idea from Luigi Nono’s …sofferte onde serene…. While there is no direct dialogue between the two sources, the Ondes’ ever-present hum adds an ethereal dimension to what is otherwise a mostly brutalistic piece. As always, the Arditti String Quartet, Garth Knox and Nicolas Hodges shine. If not for their efforts, this disc would be even less than the half-engaging amalgam it is.